After holding on to my trade overnight and seeing that price was not going anywhere, I decided to close my position ahead of the major releases from the U.S. I thought to myself that I’d rather close with a small profit than risk getting blown out by event risk. As you can see, it turned out to be a really good decision. Yay me! 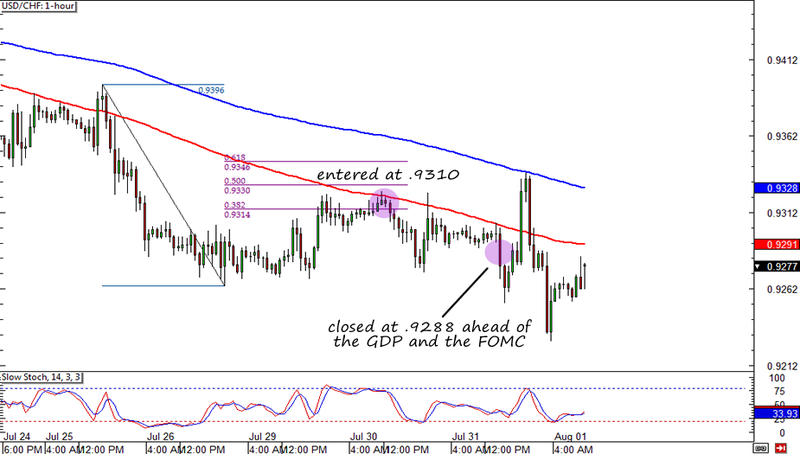 In my Pre-Week Market Analysis, I pointed out that I’m looking for a long trade on EUR/USD. Unfortunately, I’m not seeing the price action that I want, so I’ve decided to look at a different, yet very similar pair. Can you guess what pair I’m talking about? I’m talking about none other than USD/CHF! As you can see, the pair has just made a major pullback and is now testing the key 100 SMA. The 100 SMA is pretty significant as it has held as resistance multiple times before. I’ve decided to jump in at market, at .9310, as I believe the SMA will hold. 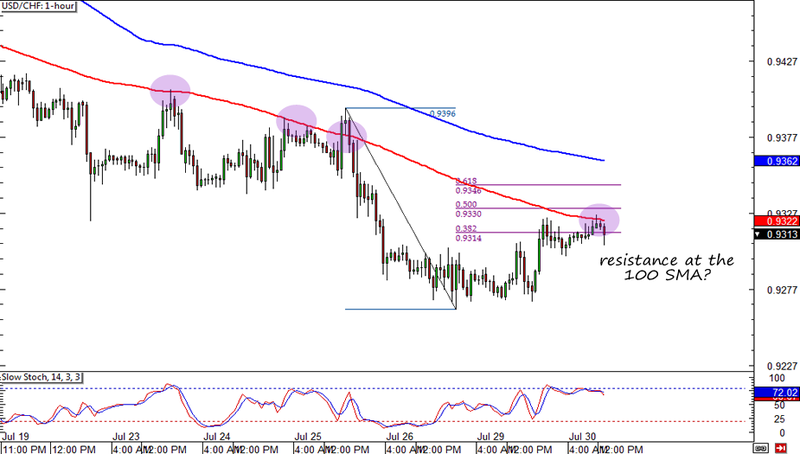 To give my trade enough room to breathe, I’ve placed my stop at .9370, which is above the 61.8% Fib and the 200 SMA. As for my profit targets, I’m initially aiming for the previous swing low at .9265 but will keep a part of my position open in the event that the pair goes strongly in my favor. I’m pretty sure you can tell that I’m feeling a bit bearish for the dollar. In my own opinion, there isn’t really much support that the FOMC statement could provide the currency. Recent economic data from the U.S. have been mixed. I’m thinking that maybe Fed officials would only reiterate what we’ve already heard from Fed Chairman Ben Bernanke, which is that tapering still is not a done deal. The overall market consensus seems to be that the FOMC would sound dovish. I’m banking on this to push the dollar low enough for me to take profit on half of my position before the actual statement is released. From there, depending on how the statement turns out, I will decide whether I should hold on to my remaining position or not. Sold at market (.9310). Profit target 1 at .9265. Profit target 2 yet to be determined. Stop loss at .9370. Risk disclosure.